NBC is like Hillary. Lying is such a way of life they can’t keep track. “Hmmm, you think the US should refrain from destroying countries all around the world? You know who else thinks that? The Kremlin! 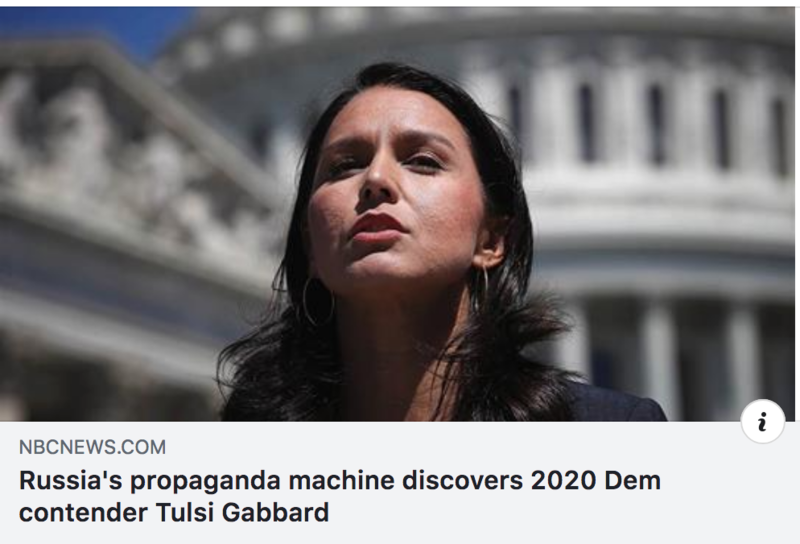 2 – Make no mistake, it is this opposition to significant aspects of the US war machine that is the driving force behind the overwhelming bulk of the shrieking objection to Gabbard’s candidacy, not any of the more valid criticisms. 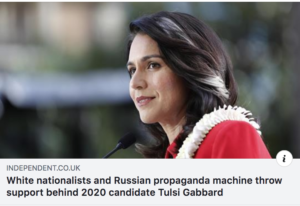 We have learned from the mainstream acceptance of Bernie Sanders and Alexandria Ocasio-Cortez that some criticism of the status quo will be tolerated when it comes to domestic policy, but it’s an excommunicable offense when it comes to foreign policy. The idea that the US should forcefully control world affairs using the carrot of alliance and the stick of military violence is so ubiquitous in both of America’s mainstream parties that it takes a Washington Postcolumnist getting dismembered alive to start a debate about something so self-evidently evil as the Saudi-led destruction of Yemen. Gabbard speaks the truth and has foreign policy common sense. It is a wonder McCain and the pentagram have allowed her to stay in office. Don’t hold your breath for any denuclearization. NK will remain nuclear because of what happened to Iraq and Libya after they agreed with US to forego nuclear development. “Our country’s history of regime change war has led countries like North Korea to develop and hold on to these nuclear weapons because they see it as their only deterrent against regime change. And this is what’s important for President Trump to recognize,” she said. 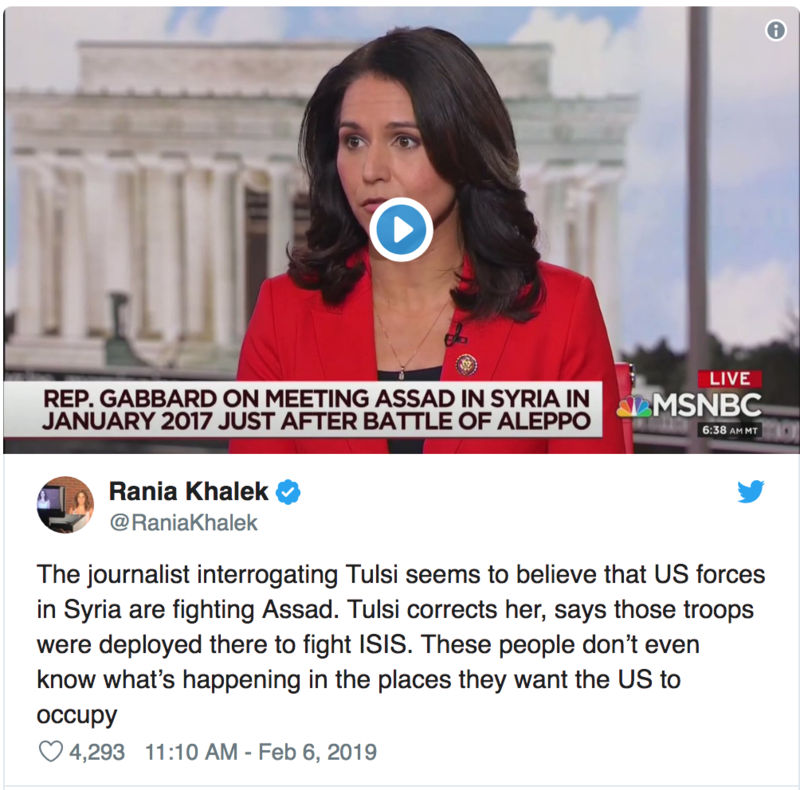 The leftist media outlets incessantly questioning Gabbard’s call for peace and an end to US-backed terrorism in Syria don’t care if our intervention has destroyed cities and murdered and raped thousands. They only care about the social status points they get in social circles where being seen outraged at airport arrival lines is more important than stopping mass murder for profit and power. A politician that deserves a little respect.